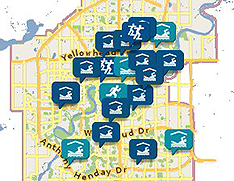 Become a City of Edmonton Recreation Centres member and take advantage of exclusive benefits. Note: Current and new Continuous Monthly and Annual Memberships are eligible for these membership benefits. Ask facility staff about becoming a member today, or call 311 for more details. 10% discount on annual Attraction membership to Edmonton Valley Zoo, Muttart Conservatory, John Janzen Nature Centre, Fort Edmonton Park and the Naturally Edmonton pass. We offer professional and individualized services to help you meet your health and fitness goals.